"The style of ancient Egyptian art is transcendently clear, something 8-year-olds can recognize in an instant. Its consistency and codification is one of the most epic visual journeys in all art, one that lasts 30 dynasties spread over 3,000 years. That’s the era—as long as six Roman empires, or a dozen American ones—we all know for its pharaohs and pyramids and sphinxes, Tutankhamen and Rameses, and that brief instant in the Eighteenth Dynasty when art comes within a hair’s breadth of a lyrical naturalism we associate with Ingres." These recipes follow my post on Egyptian art. 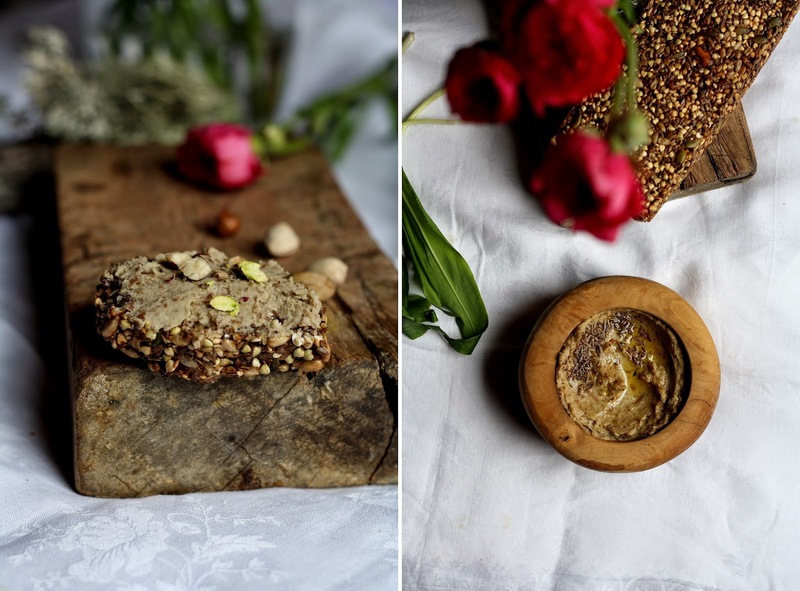 There are two traditional recipes from Egypt, well dukkah is (dukkah bread, not so sure) and it's absolutely amazing. You can sprinkle it on pretty much anything. I got the idea of including dukkah into bread from Jessie's dukkah & avocado on toast. I thought : why not include dukkah in the bread! 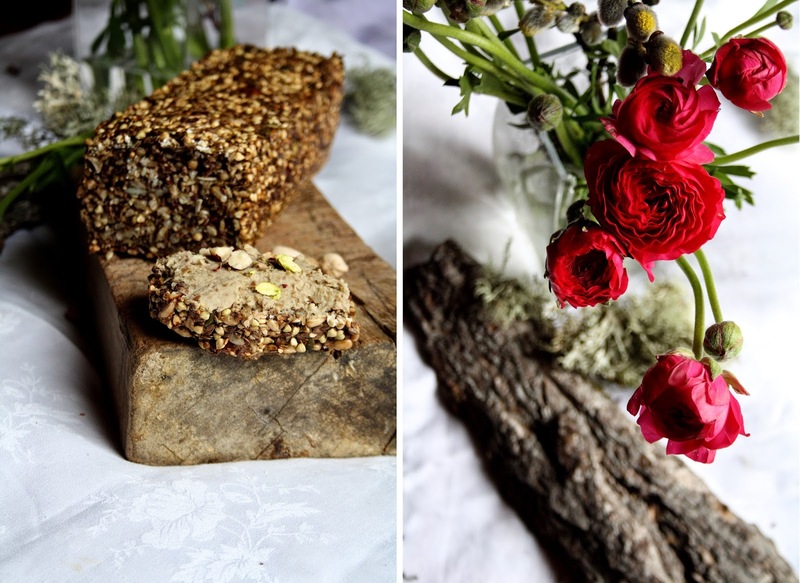 I love this bread, it's nutritious and grain-free (if you eat buckwheat, technically buckwheat is a seed, not a grain). Ful medames is a bit like hummus, served in the street in Egypt as breakfast with some kind of bread, sometimes with eggs : it's so filling, it's so perfect for breakfast! Make the dukkah itself first by grinding the nuts in a mortar (I don't advise using a food processor as it will make too small piecs), place the nuts in a large bowl and slightly grind the seeds together. (Note that you can toast the seeds and nuts prior to grinding if you want more a more fragrant bread, or just want to make the dukkah to sprinkle on salads...). Throw in the bowl the seeds, and the other ingredients, mix well to combine. Cover with a fresh towel and let sit overnight. Preheat oven to 160°C, pour batter into two silicone loaf moulds (I needed two, the original recipe only needed one, mine might be smaller). Bake for 40 minutes, then flip the bread and replace it in the mould. Bake for another 40 minutes or until very crisp. (Again, the original recipe calls for 2 x 1 hour but 40 minutes were enough for me). Let cool on a rack before slicing. The bread freezes well and keeps for about 5-7 days in an airtight container. Cook your fava beans the way you like. I cooked mine 35 minutes in a pressure cooker. I think it's the easier method (and takes less time). Once cooked, let cool a little while, place favas and garlic cloves in a food processor with the S blade on, and mix until somewhat smooth (depends on the texture you want, some like ful very smooth, some less). Pour in the olive oil and the lemon juice, season to taste. I like to add a bit of chili but that's not very traditional. Love so much this recipe! Reminds me of the recipe from Green kitchen stories, but with buckwheat sounds even more interesting! Will give it a try this week! Thank you, Aurélie!